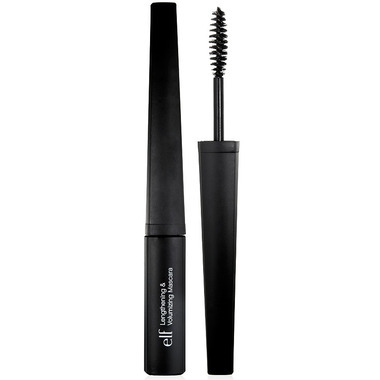 Achieve thicker, fuller, and longer lashes that are beautiful and natural with e.l.f. Studio Lengthening & Volumizing Mascara. The enlarged brush coats your lashes evenly for an enhanced appeal. The unique formula is clump free and quick drying so you can have color that stays on all day with no smudging and no flaking. Terrible product!! Clumpy mascara, brush comes out with all kinds of product on I it and makes it very difficult to apply. Made my eyelashes surprisingly long and full looking. Not lumpy or sticky, not smudgy. Only needed one swipe across my lashes too. Not tested on animals, can't beat the price - worth trying. I like this mascara - it lengthens and darkens my lashes and is non-irritating to my contact lenses. I like the price too and the fact that it's cruelty-free. I took a chance on this mascara because it has many great reviews and, for a vegan mascara, it's not expensive. Unfortunately it's junk. The only thing I like is the brush style and wand length. The formula is awful. It's clumpy on the brush and doesn't pull through smoothly on my eyelashes. I wore it for a few hours and it was flaking. Love that it's vegan, and it goes on nicely! Not the worst you can get but not the greatest. good value for the $$ and its vegan which is a plus but if your after longer more dramatic lashes then look elsewhere. If you want a more natural look and just make your eyelashes darker, it does that. very nice , you can adjust if you want just a little , or a more dramatic look by applying more ! no clumping , like the brush for definition ! I love this mascara. It's affordable and the best part it is vegan! I couldn't ask for anything better. Good price, but the mascara isn't great. Average mascara .. the brush is good for definition and separating lashes but the serum is average.